For our two night stay in Hong Kong, we reserved a Harbour View room at the Hotel Ibis North Point, a small budget hotel in a mostly residential area on Hong Kong Island. The hotel sits right across a bus terminal from the waterfront, just a few steps from stairs down to the North Point MTR, making it quite convenient to the rest of Hong Kong. The neighborhood is very local and residential, with nearby tenements, small stores and noodle houses, a wet market and “cooked food center” down the road, and not much English spoken, so the easy access to the more touristy spots of Hong Kong was appreciated — six quick MTR stops to Central. The guest rooms at Ibis North Point are very, very cheap because they are very, very small. Our full-size bed took up most of the room, with barely enough space between bed and wall for our bags, which we had to hop over to get to the tiny desk and window. The carpet had coffee stains, the bathroom was tiny and lacked an exhaust fan, the mattress was a bit too firm, the walls a bit thin, the elevators rather slow and cramped, the lobby a floor up from the hotel entrance, and internet only avaiable in prepaid cards at 3 hour increments, but hey, we were paying under $60/night, and it was still better than tolerable, even with two in a room. 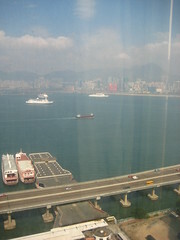 An added plus: harbour-facing rooms commanded a lovely view of Kowloon and the old peninsula which used to be Kai Tak Airport. So yeah, for the low price, Ibis North Point is a great hotel if you need a small room with just the bare necessities, close to the MTR. We paid a total of about US$240 for two nights with a couple of internet cards, just a bit lower than what we paid for a single night at Novotel Citygate. That’s pretty good. More info: Official Ibis North Point Hotel page, and TripAdvisor reviews.